my teacher decided to present me today with a trip to the shanghai museum for lots of historical learning, and a traditional shanghainese dinner. 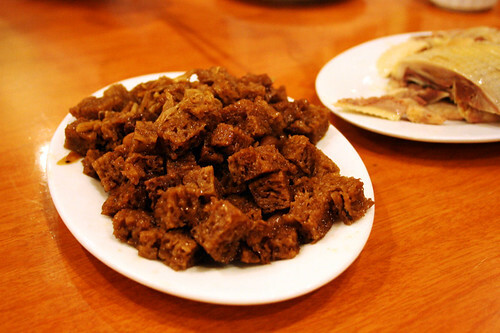 shanghainese cuisine is typically a little sweet, and uses quite a bit of soy sauce… promising, heh? 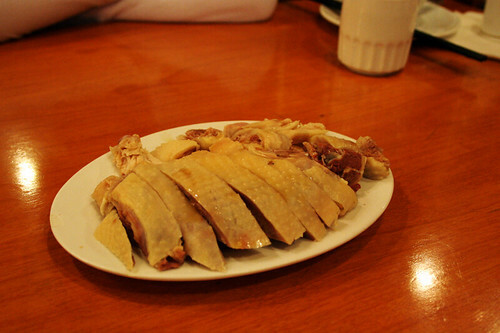 salty chicken: hum… mamahuhu, just so so. it was a bit dry and cold… that’s probably the way it is supposed to be, but it’s not really my thing. 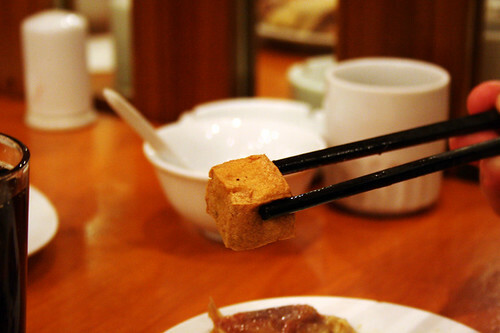 kaofu: a sort of spongy tofu, it was good. 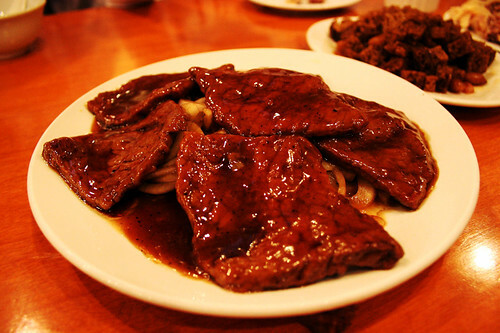 meat in black pepper sauce: errrr, it was good, but somehow i don’t think this is a shanghainese delicacy? perhaps she just wanted to be nice and offer us something a bit more familiar. it was quite hard to eat with the chopsticks, but we made it! 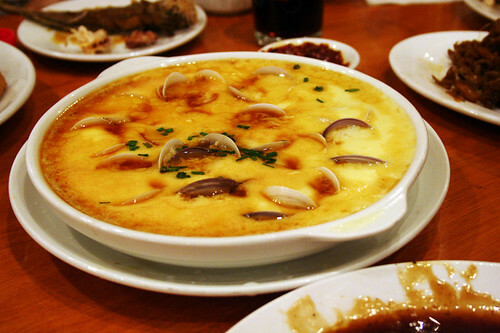 egg and shells: sea shells in a semi-solid jell-o-like egg mixture. a bit strange. i still don’t know what to think of it, not my favourite. 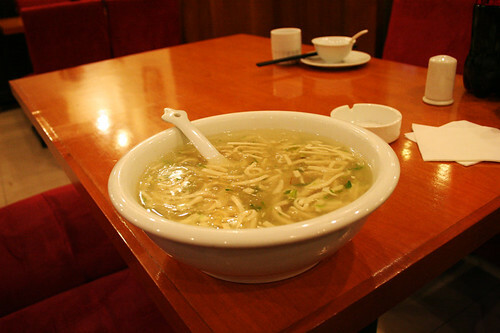 bean curd soup: when i looked at this soup, i was expecting the worse… it looked quite consistent and i was fearing the flavours might be a bit too strong for me… but actually, they were just right. 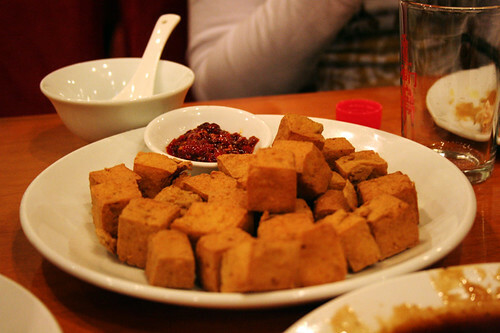 the bean curd strips were so soft they melted in your mouth… yummy! spiky fish: i don’t know the real name of this dish, but it’s something to do with pine. maybe pine tree fish? anyway, it’s yummy, probably the best of the bunch. 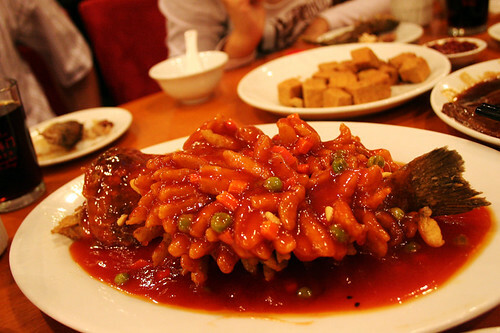 they take the bones out, shape the fish in this spiky form, then cover it with flour and fry. in the end, they top it all with a sweet (and slightly tangy?) sauce. it’s soooo good. so now you know what to expect. my teacher says this restaurant is quite good, so if you’re in the mood for some shanghainese delicacies, it’s a little place called farm restaurant in kangping road, 220 (near huashan road). I would be curious to taste the soup, but I wonder, why do they need to keep the head and tail of fishes ? Do they eat them ? 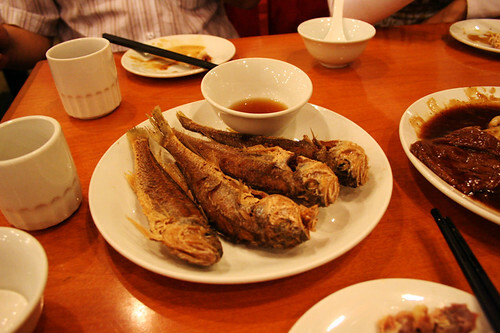 The fish is called squirrel fish (松鼠鱼). Squirrel simply refers to the style it’s cooked in. I may check this place out in July. all i can think about, reading this post is, omg, that’s a helluva lot of food! did you actually eat all that? !